Whenever I travel into the African bush I’m aware, all too well, that anything can happen. From an indigenous predator wandering into the village, a snake making its way to our campsite, or a spider the size of my hand finding its way to my bed, there is no end to the challenges. Although the villagers are used to many of these issues, there are other matters that appear to be much more pressing. We’ve spoken before about the urgent need for clean water and nourishing food — a task that must be accomplished each day anew. But the villagers gladly rise to the occasion. There is a much more dangerous problem—man. The Lord’s Resistance Army, or LRA, is a brutal militant group led by men who have no concern for the well-being of their own people. They are takers with no moral compass to tell them right from wrong. 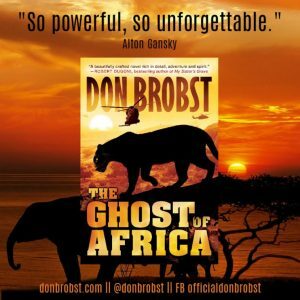 In my novel, The Ghost of Africa, the hero finds himself in a very precarious situation — one he cannot conquer on his own. This forces him into a form of jeopardy, which he must overcome somehow. One of my mentors, best-selling author Alton Gansky, has written a number of books in which the protagonist of the story, or someone else we care very much about, find themselves in jeopardy. 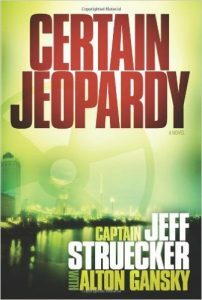 One of my favorite works by Alton is his book titled, Certain Jeopardy, in which a certain jeopardy situation presents itself, placing the United States and others in imminent danger. Although we often find ourselves in dangerous situations in Africa, we must remember why we’re there — we came to help, we’re there to give our all, and our focus, in addition to providing much needed medical care is to deliver Good News. If you haven’t had the privilege of reading the thriller, adventure, mystery books by Alton Gansky, you’re in for a treat. Please visit Alton’s Author page on Amazon and get started. My novel, The Ghost of Africa was released last Tuesday and I could not be more excited by what God has in store. I invite you to pick up a copy right away, and then leave a review on Amazon for me. It would mean a great deal. Although I’ve just returned from Africa, I can’t wait to go back. I very much appreciate your support. God is at work.